Willie Bivins, Noberto Apellaniz, congas. The manner in which Lonnie Smith has rallied his spiritual and material forces for this recording leads me to believe the shadows of gradual obscurity will not have the chance to cover one so thoroughly committed to his art. 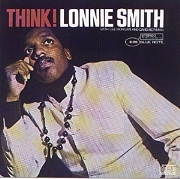 It is apparent that because Lonnie does think, he is fundamentally, intellectually and musically equipped to be himself, as he so well demonstrates throughout the five selections heard in this album, Think. "Son Of Ice Bag" launches side one of this beautiful Blue Note adventure. The tune itself was written by Hugh Masekela. It has a joyous beginning in good taste and restraint. Then, the cue is given and guitarist Melvin Sparks takes over with a solo that flashes excitement as it glows and sparkles with vitality. Melvin's guitar packs a free and easy flow of improvised melody. David Newman solos with the customary swinging know-how with which he has been identified so long, but he closes it with a great edge on today's sound, yet he doesn't overpower you with it to a point where he has your nerves rattling. Then, as if by E. S. P., Lee Morgan enters with the beautiful "bee" and "bird" sounds of his trumpet. He surges ahead with the same Morganese we've enjoyed through the years, and he does it with controlled vigor and freshness. After a brief unified statement by the group. Lonnie slides in unobtrusively with some organ pumping that will have you up and doing your own thing by this time. From the very beginning, you can detect that Lonnie is full of imagination and zest. He digs in and cooks in such a way as to come out sounding strictly Lonnie Smith. All in all, the group has a successful flight on this one. "The Call Of The Wild," a Lonnie Smith original, is a well planned expedition. It begins by wrapping itself around you with beautiful warmth and quietness. Then wow!! With the gates open and the barriers down, Lonnie and his men leap out. A great Latin sound has been created here. Lonnie shows that he has the knowledge and abundant know-how to compose pieces against accepted beliefs. He reconciles the two themes with marvelous technique suggesting the trained musician's skill and ability in timing and coordination. Sparks, Morgan and Newman once more have the opportunity to acquit themselves admirably with excellent solo spots. Lonnie's great organ propulsion is behind the whole action. You feel the injection of imaginative excitement and fervor rising from his keyboard as it whirls around great instrumental interplay. The percussion heat generated by Marion Booker, Jr. and Pucho in the lead is a sheer knockout. The pulsation of "The Call Of The Wild" will liberate the most controlled id. "Think," the well chosen title tune, is the Aretha Franklin and Ted Wright soul classic. On this one, Lonnie and his music mates wear their "considering caps" with great style. This one isn't just played. It's interpreted. The good vibrations take little time to impress you. Forget about all that intellectualizing for a while and help yourself to a heavy sampling of Lonnie Smith as he sermonizes his way across town on this soul beat. One of the interesting things about "Think" is the fact that Lonnie obviously does not have time for exaggeration of fact. Rather, he tells it like it really is, and after all when you are running for public acceptance there's nothing else the people want to hear. Think is an excellent showcase for Lonnie. If nothing else, his performance does much to broaden his already wide appeal. "Three Blind Mice" are blind no longer. Figuratively speaking, Lonnie has helped these three overcome their legendary plight by breathing new hope into their souls. With the aid of his brothers in music Lonnie has enabled these mice to stop chasing the wrong object and pick on something more to their fancy instead. "Slouchin'," one of the best tunes on the album, is another Lonnie Smith original. This piece means just what it implies. There's nothing else to do for a while, so let's take a holiday and do some slouchin'. Here again, the Lonnie Smith organ touch is not only a happy and moving one, but is immediately identifiable. The leader and his soul brothers display all their magnificent growth. Sparks gets the first solo nod. His guitar work is tasty. Morgan launches a solo that won't let go. Newman takes it next and by the time he turns the piece over to the boss, everybody within earshot is "Slouchin'." Lonnie keeps it going in such a way with his free and easy organ style, that before you realize it, your shoes are off and the "Slouchin'" is over. Booker and Pucho lead the percussion section in a nice galloping fashion and cheer their leader all the way home. Jazz continues to stay alive, interesting, fresh sounding to our senses, a vital art of today (with a great past and hopefully an exciting future), thanks to artists like Lonnie Smith, who Think. --RHETT EVERS, from the liner notes.